Published by Bloomsbury, Skateboarding and the City by Professor Iain Borden launches on 21 February and is now available for pre-order. The book presents the only complete history of skateboarding, exploring the story of skate culture from the surf-beaches of the 1960’s California to the latest developments in street-skating and the wider skating world of today. Through his book, Iain reveals a vivid understanding of how skateboarders, through their actions, engage with the city in a unique way. “Skateboarding and the City has been a long time coming, and is the culmination of 30 years of researching and writing about skateboarding. I am naturally delighted that The Bartlett and UCL have supported me so generously in doing this work, and equally that Bloomsbury have created such a vibrant and colourful publication. Iain is a life-long skater and is now Professor of Architecture & Urban Culture, and Vice-Dean of Education at The Bartlett School of Architecture. He has previously authored and co-edited publications including Forty Ways to Think About Architecture: Architectural History & Theory Today, and Drive: Journeys thorough Film, Cities and Landcape and is a sought-after commentator about the the subculture of skateparks. 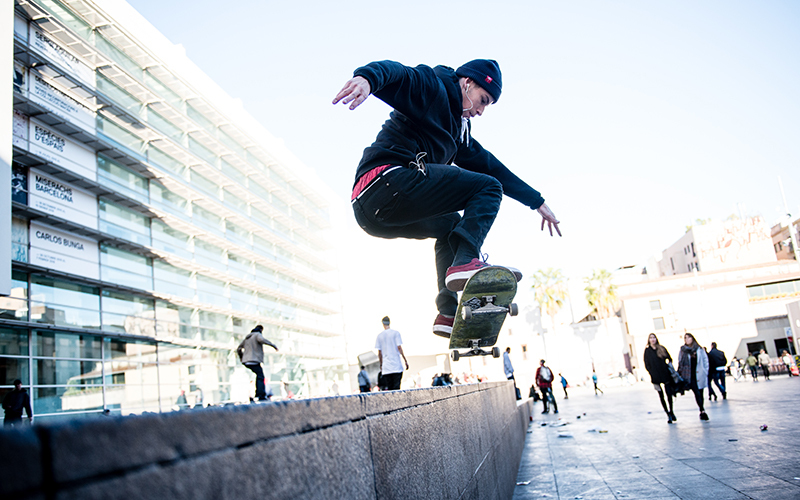 Image: Skateboarding MACBA’s space of symbols, Barcelona (2015), © Emmi Holmer.